The electrophoresis simulation software, GENTRANS, has been modified to include the interaction of analytes with an electrolyte additive to allow the simulation of liquid-phase EKC separations. The modifications account for interaction of weak and strong acid and base analytes with a single weak or strong acid or base background electrolyte additive and can be used to simulate a range of EKC separations with both charged and neutral additives. Simulations of separations of alkylphenyl ketones under real experimental conditions were performed using mobility and interaction constant data obtained from the literature and agreed well with experimental separations. Migration times in fused-silica capillaries and linear polyacrylamide-coated capillaries were within 7% of the experimental values, while peak widths were always narrower than the experimental values, but were still within 50% of those obtained by experiment. Simulations of sweeping were also performed; although migration time agreement was not as good as for simple EKC separations, peak widths were in good agreement, being within 1-50% of the experimental values. 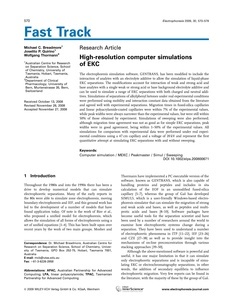 All simulations for comparison with experimental data were performed under real experimental conditions using a 47 cm capillary and a voltage of 20 kV and represent the first quantitative attempt at simulating EKC separations with and without sweeping.